Sipe Law Firm (“SLF”) is located in the Wells Fargo Center on Main Street in historic downtown Rock Hill, York County, South Carolina. SLF is a South Carolina limited liability company. The principal is W. Henry (Hank) Sipe III. Hank has thirty years of legal experience in the areas of Estate Planning and Estate/Trust Administration, Business/Corporate Law and Tax. An alumnus of Woodberry Forest School, Hank graduated from the University of Virginia with distinction in 1979, and received his law degree from the University of Richmond in 1983. After law school, he clerked for United States District Court Judge William M. Acker, Jr. in Birmingham, Alabama. Hank earned a Masters in Tax Law (LL.M.) from Georgetown University Law Center in 1988, and is a former Certified Tax Specialist in South Carolina , as designated by the Supreme Court Commission on Continuing Legal Education and Specialization and approved by the South Carolina Supreme Court. He is admitted to practice law in South Carolina, Virginia (Associate), and the District of Columbia (Inactive), and is admitted to practice before the United States Tax Court. 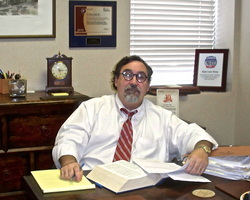 Prior to establishing his own law firm, Hank was a partner with Kennedy Covington Lobdell & Hickman, LLP (now K&L Gates), headquartered in Charlotte, NC, and Hamilton Martens Ballou & Sipe, LLC in Rock Hill, SC. Hank is rated AV® Preeminent™ by Martindale-Hubbell®, signifying that he has been ranked by his peers at the highest level of professional excellence. He is recognized by The Best Lawyers in America®† in the categories of Trusts and Estates, and Tax Law, and has been listed in South Carolina Super Lawyers®‡. Sipe Law Firm is also included in U.S. News-Best Lawyers® “Best Law Firms”. †The Best Lawyers in America® (Copyright 2018 by Woodward/White, Inc., Aiken, SC) is widely regarded as the definitive guide to legal excellence in the United States. Lawyers are selected for inclusion on the list through an exhaustive peer-review survey in which thousands of the top lawyers in the United States confidentially evaluate their peers. ‡ South Carolina Super Lawyers® (2009). © 2018 Super Lawyers® is a registered trademark of Key Professional Media, Inc., Minneapolis, MN. South Carolina Super Lawyers® is an annual listing of outstanding lawyers around the State who have attained a high degree of peer recognition and professional achievement. Only five percent (5%) of the total lawyers in the State are selected for inclusion.